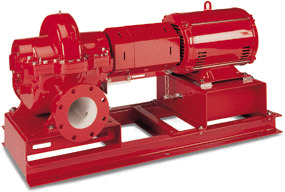 Double-suction, base-mounted Series HSC pumps are available in 2 through 10 sizes. Motor sizes through 300 HP. Flows to 6500 GPM and heads to 400 feet. Bronze-fitted construction with a maximum working pressure of 175 psig. The HSC features internally self-flushing mechanical seals for maximum lubrication, debris removal and heat dissipation. The internally flushed seals allow for a shorter shaft for reduced deflection for longer seallife. Closed-end steel baseplate with full seam welds for strength and an open top for easy grouting. The pump bearings and mechanical seals can be serviced without disturbing the upper casing half, piping connections or electrical motor connections. An ANSI-OSHA-compliant coupling guard shields the flexible coupler.